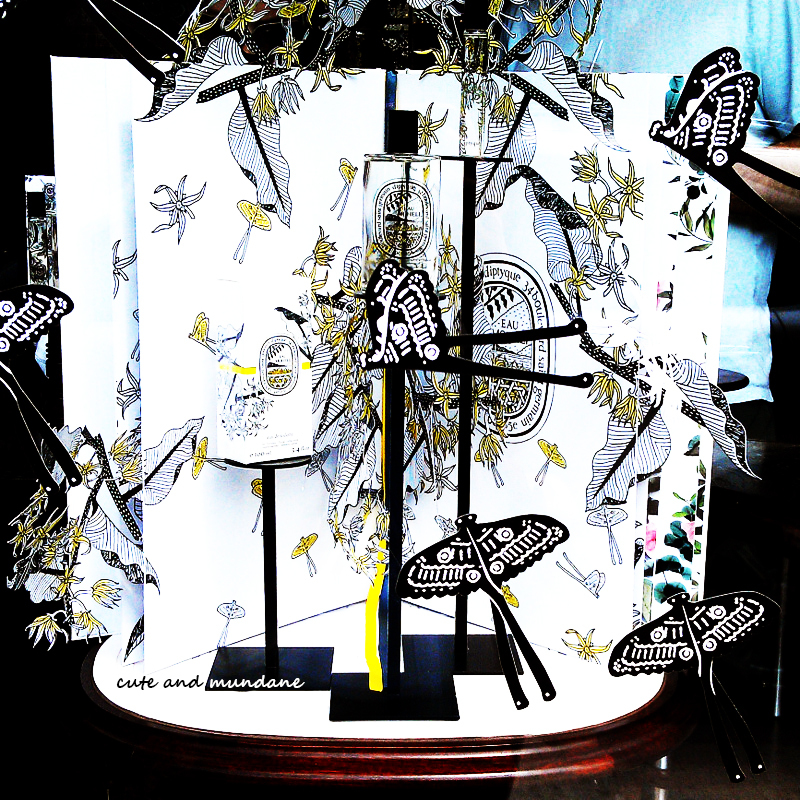 Welcome to the latest installment of Inspired by Art! With today's fast paced lifestyle, it's easy to become overwhelmed by the unrelenting flow of work and responsibilities. 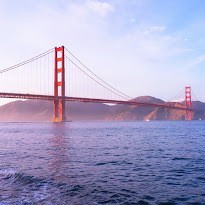 When the burdens become too great, we yearn for an escape, be it to a faraway shore, a memory in time, or perhaps even anywhere but the here and now! It's easy to forget even in this summer season what summertime meant for many of us as children: an idyllic time when we could relax and enjoy the simpler things in life. In 1891, stockbroker and businessman Paul Gauguin, frustrated by a series of business failures and difficulties in his married life, was compelled to escape from the hustle and bustle of the European markets, leaving his wife, children, and civilized life behind for the unspoiled Pacific shores of Tahiti. It was probably no mistake that Tahiti happened to be about as far as one could get from Gauguin's home country of France, nearly 10,000 miles distant, almost exactly on the opposite side of the globe. Being a romantic (and an escapist in a very literal sense), Gauguin had hoped to find a primitive, peaceful life in Tahiti. Unfortunately by the time he arrived, Tahiti had already been significantly altered culturally by French colonization. Disappointed but undeterred, Gauguin settled in Mataiea village to pursue his art. Chasing visions of a land untouched by western culture, he painted Tahitian scenes colored as much by imagination as by reality. Fatata te Miti (By the Sea, 1892), painted on Gauguin's first visit to Tahiti, is a beautiful example of these fantasies brought to life- an ultimate escape from realities both past and present. In Gaugin's Tahitian paradise, we see deep sea tones contrasted by the pink sand and bright florals. 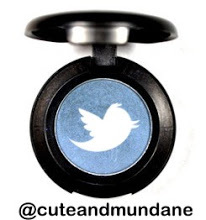 My Fatata te Miti inspired look starts with sultry teals to add an ocean's depth to eyes, such as MAC Plush eyeshadow alone or mixed with Urban Decay Loaded eyeshadow (reviewed here) for a deeper teal. MAC Soot eyeshadow and Urban Decay Freakshow (reviewed here) can deepen the look, like the shadowed tree and and in Gaugin's painting. The lilac pinks and lavenders in the sand can be used on lips and/or cheeks to provide beautiful contrast to the dark water tones on the eyes. MAC Peony Petal blush fills this role nicely. The tangerine, yellow, and red-orange found in the florals draped across the beach can be used as surprise accents and embellishments in this Gauguin-inspired look. 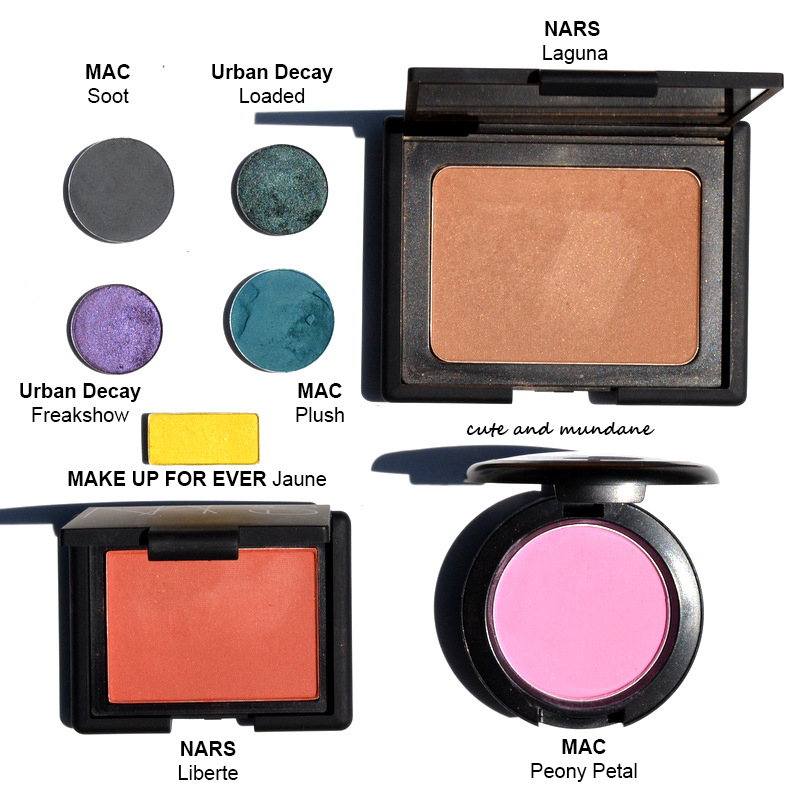 Such colors in my collection include MAKE UP FOR EVER Jaune (reviewed here) and NARS Liberte (reviewed here) layered over MAC Cremeblend Blush in Optimistic Orange (see swatch here) to add intensity and brightness to the color. NARS Laguna bronzer adds a nice Tahitian tan to the look as well. I've chosen an array of nail colors for this Fatata te Miti inspired look. Reflecting the optimistic colors of the pink sand and flowers are Essie Lovie Dovie (reveiewed here), Essie Chubby Cheeks, and SpaRitual Positive Vibe (reviewed here). Butter London Tea & Toast (reviewed here) is the color of warm sun-kissed skin. The mid-ground blue and purple shadows are represented by China Glaze Jungle Queen (reviewed here) SpaRitual Osmium (reviewed here). China Glaze Exotic Encounters (reviewed here) and Sephora by OPI Mermaid to Order are beautiful teal tones, perfect for summer. Finally, I have a few fragrance recommendations to finish my Gauguin inspired look. (For the past few Inspired by Art posts, I've been using fragrance to quite literally add another layer to the experience!) I hoped to channel the Tahitian feel of Fatata te Miti with notes from the Tiaré flower (Tahiti's national flower) and Coconut (the classic Polynesian tree). Kate Spade Live Colorfully is a beautiful combination of Tiaré with Coconut water and would make a great scent compliment to a Gauguin inspired look. For a fresher Tiare flower fragrance, I'd recommend Versace Vanitas. If you're a fan of coconut blends for summer, Versace Crystal Noir (sensual Gardenia and coconut), Pacifica Indian Coconut Nectar (a coconut and vanilla gourmand), and Serge Lutens Bois de Vanille (a vanilla and coconut gourmand) would be great picks as well. 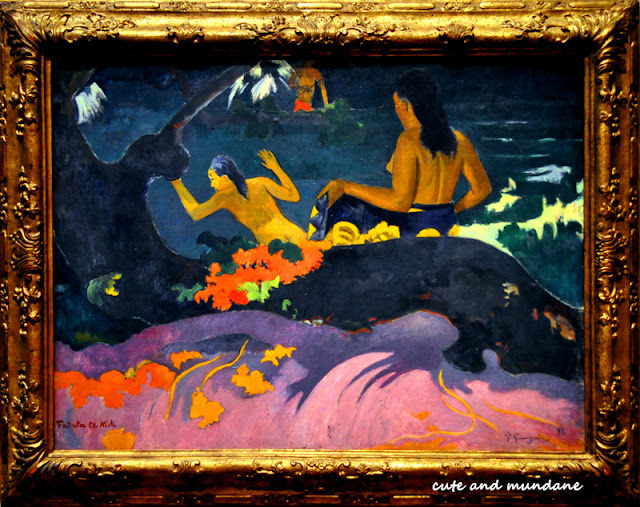 Though Paul Gauguin may not have found the pure idyllic escape he was looking for when he reached Tahitian shores, he was still able to distill the spirit of paradise into Fatata te Miti and his other works. The brilliant brights and daring deep tones provide gorgeous color combinations and tropical inspiration for the upcoming summer months. Gauguin's tale reminds us that sometimes when we're overwhelmed by the daily grind, it's good to find renewal in exploration and to take in the summer sun. Sometimes a change of pace and scenery is all it takes to dive into our own little slice of paradise! P.S. 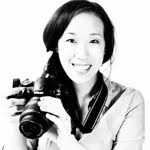 Be sure to check out more posts in my Inspired by Art series here! Chicago is lucky to have one of only four Diptyque boutiques in the United States (two being in New York City on Bleecker St. and Madison Ave., and one on Maiden Lane in San Francisco). Chicago's boutique is nestled in Bucktown, which has a nice set of shops away from the hustle and bustle of North Michigan Avenue. Candles and perfumes packed in neat wooden displays decorate the cozy interior--- it's a bit more spare and streamlined than the glitzy Bleecker St. boutique, which I've also passed by. Recently, I stepped into the Chicago Diptyque boutique after seeing their brand new perfume, Diptyque Eau Mohéli, on display! Diptyque Eau Mohéli Eau de Toilette is an exotic floral perfume inspired by its namesake island. Moheli is part of a three island archipelago that makes up the nation Comoros, located off the east coast of Africa between Mozambique and Madagascar. The island is rich in flora; visitors can enjoy the striking fragrance of ylang-ylang, and admire a bevy of local orchid species and endemic palms. Moheli is also home to baobob trees and a number of pepper and vanilla plantations. 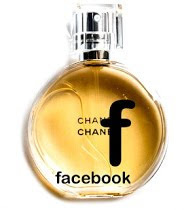 Notes: Floral notes, Ylang-ylang, patchouli, pink pepper, ginger, vetiver, benzoin, incense. Diptyque Eau Mohéli Eau de Toilette is an exotic floral perfume crafted around ylang-ylang. Woody benzoin opens the scent; it's spicy, but a bit watered down and not-so-acrid. Ginger root immediately follows (it's more dry peel-on ginger as opposed to fresh cut) and has a lasting presence throughout the scent. The root is laced with a generous helping of pink pepper that tickles the nose. These spices enhance the natural character of the warm ylang-ylang, which is joined by pretty florals that add a nice lucidity to the scent. In the second part of the fragrance, the root-like character of the perfume transfers from ginger over to vetiver. The green root-like smell has an odd warm freshness --- like a green mist exhaled by large jungle fronds under the burning sun. A light patchouli fits in seamlessly with the vetiver, adding a fuzzy focus and depth.The final dry-down features ginger, ylang-ylang, patchouli, pepper, and a leafy jungle green. 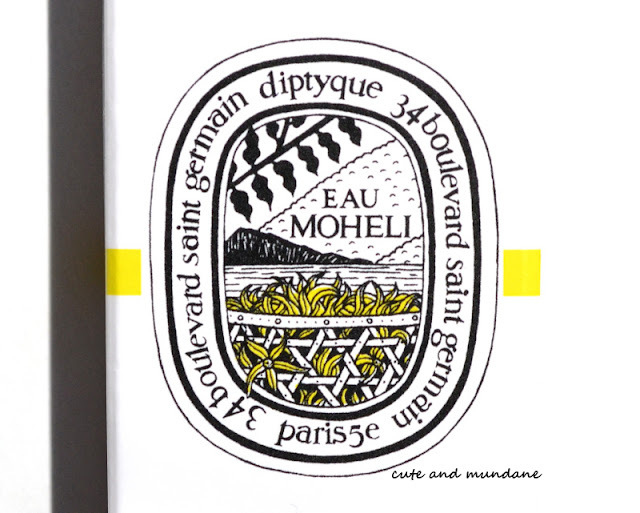 The refreshing breath of hot fronds and pretty flowers combined with the warm medicinal feel of the roots and spice in Diptyque Eau Mohéli definitely channels the feel of an island jungle under the sun. The perfume is full but not heavy. I found that the heat of one's skin plays a significant role in the scent experience. On strips of fabric or cool skin, it's easier to appreciate the florals and lush green tones in Diptyque Eau Moheli. On warmer skin, the ginger and roots seem to predominate. If you're interested in Eau Moheli, I'd recommend trying the perfume on your skin first to see how it behaves. Diptyque Eau Mohéli is a spicy ylang-ylang perfume that really captures the imagination. It's an off-the-beaten path type of scent that channels the ylang-ylang flowers, pepper plantations, and warm green vegetation of its namesake island. I'd definitely recommend a sniff of Eau Moheli this summer --- you might be surprised where it takes you! Thanks for reading! Have you tried Diptyque Eau Moheli? Have you ever visited a Diptyque boutique? What was the last Diptyque perfume or candle you tried? P.S. 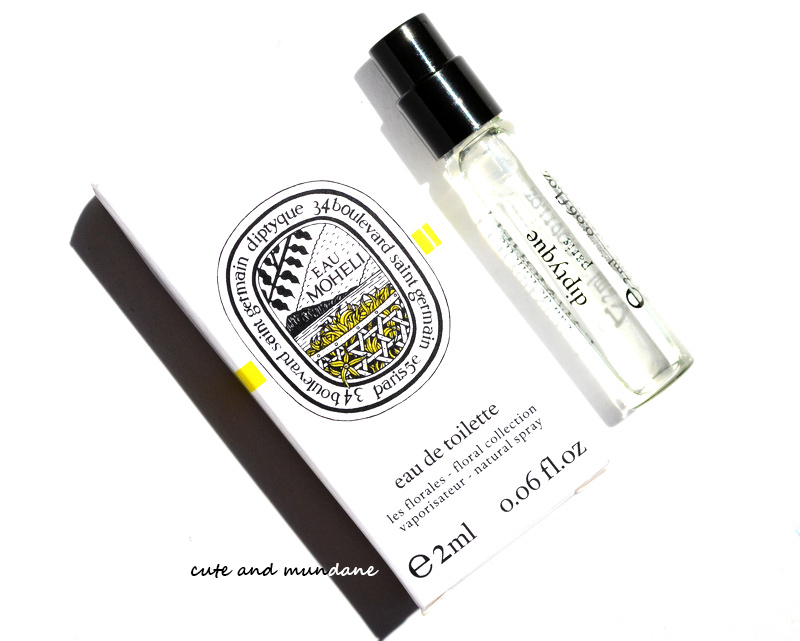 For more Diptyque, be sure to check out my review of Diptyque Volutes! 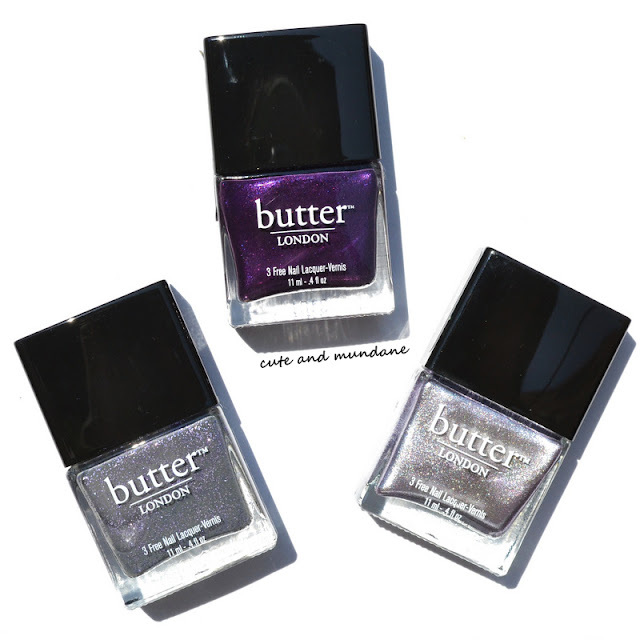 I have a royally exciting trio of nail lacquers to share with you today! The Butter London The Royals Collection is a limited edition trio of the brand's popular British royalty-inspired colors. The set includes Butter London Pitter Patter which is currently available, as well as two iconic limited edition colors: Butter London No More Waity Katie and Butter London Lillibet's Jubilee, which were re-released just for this special set. 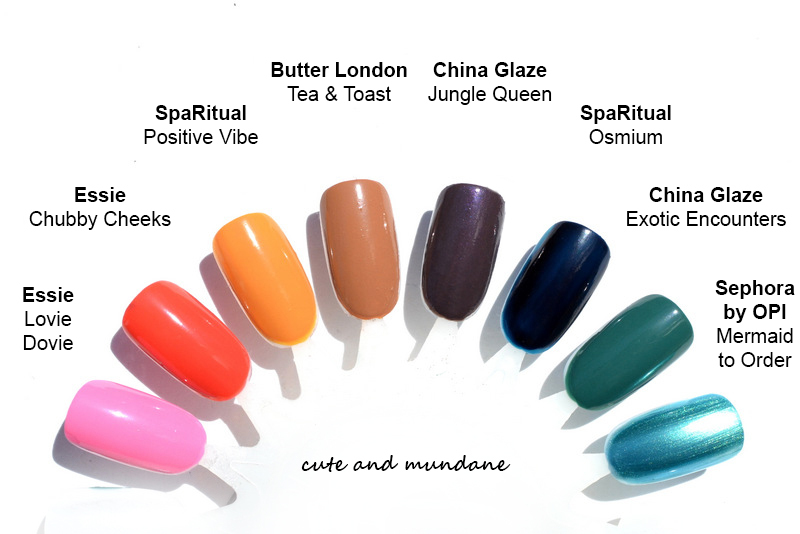 I've been delighting in all three nail lacquers courtesy of Butter London, and have a review and swatches for you below! If you've noticed, all three polishes are purple! This is no coincidence. Purple has been associated with wealth and royalty for centuries. This was partially due to the difficulty and cost of producing purple dye in the old days. (Fortunately for purple lovers, it's become much more accessible since then!) 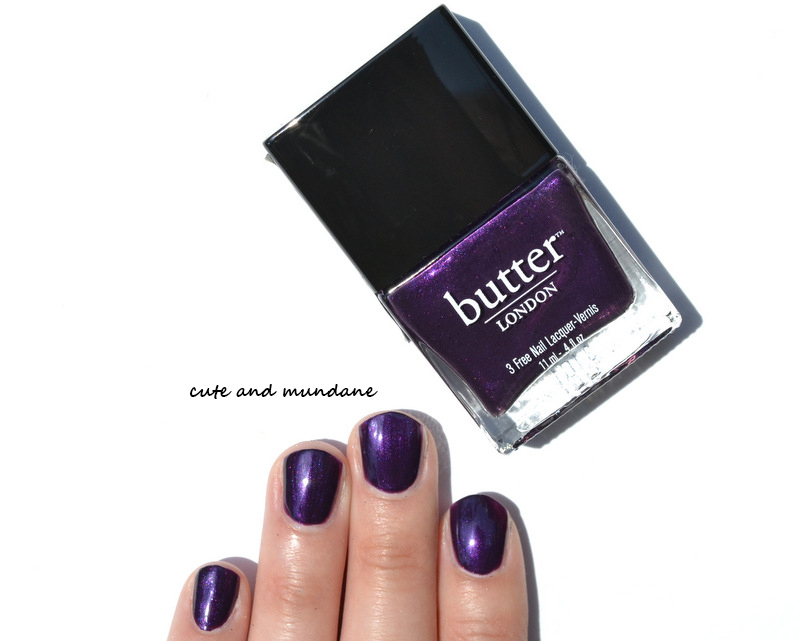 Butter London Pitter Patter (see my review and comparison swatches here), the newest color of the three, is a deep aubergine nail lacquer with subtle shimmer. It was just released in honor of the the royal baby-to-be! Butter London No More Waity Katie (above) is a really cool grey lilac nail polish with glass flecks; it's semi-sheer, but I've built up the color above with a couple more layers so that you can better appreciate it. This very popular color was formulated in honor of Kate Middleton's marriage to Prince William. Butter London Lillibet's Jubilee (below) is a beautiful lavender silver foil nail lacquer. This polish was created in honor of Queen Elizabeth II's Diamond Jubilee! 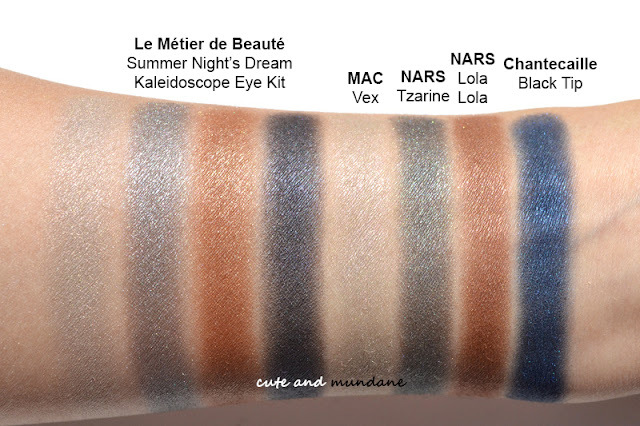 I've made some comparison swatches below so that you can get a better idea of the colors in the Butter London The Royals collection. Butter London No More Waity Katie is lighter and greyer than China Glaze Jungle Queen (see review and swatches here). Butter London Pitter Patter is quite similar to NARS Purple Rain nail polish, however it has less red and the shimmer is more subtle. 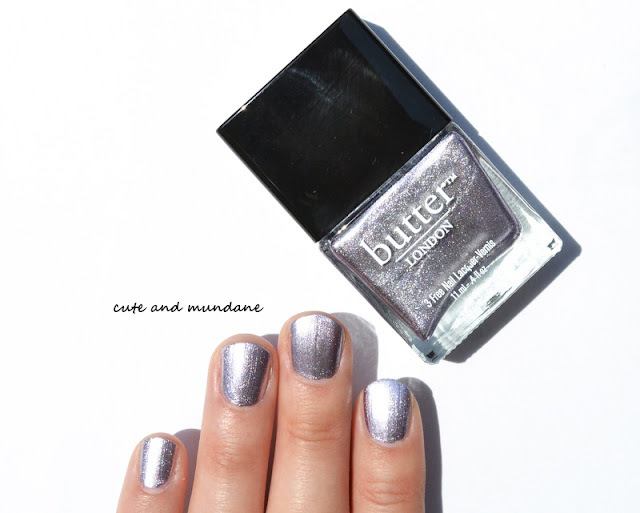 Butter London Lillibet's Jubilee appears to be silver when worn alone, however you can appreciate its lilac undertones when compared to SpaRitual Silver (reviewed here), a blue-leaning silver. 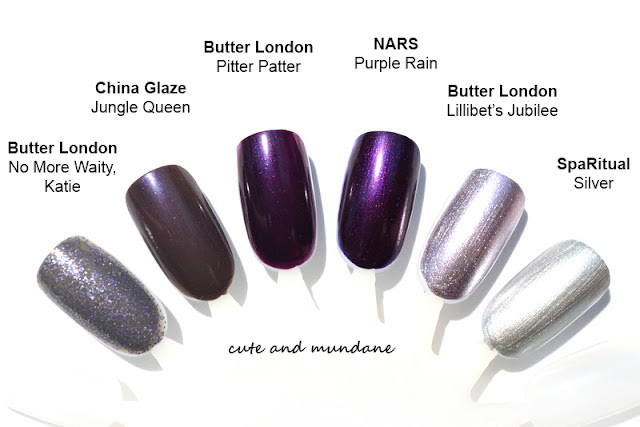 The Butter London The Royals Collection ($39) is a gorgeous set of nail polishes that commemorates important milestones in contemporary British Royal history. It's a trio that both royal enthusiasts and purple polish fans will love. For those interested in the Butter London The Royals Collection, the limited edition trio is available online at Butter London. Thanks for reading! Are you a purple polish person? Which of the Butter London 'The Royals' polishes catches your eye? I've coveted Essie Lovie Dovie for quite some time now --- after all it has a really great name, right? I've finally been able to add it to my collection, thanks to Essie, and have a review and swatches to share with you today! 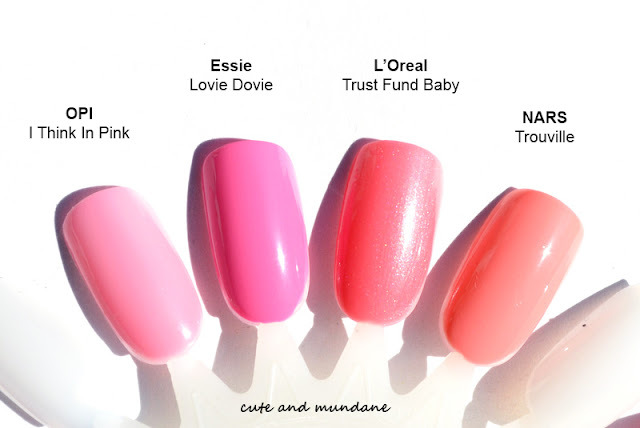 Essie Lovie Dovie is a light-to-medium pink creme that looks a lot like a vintage barbie slipper. OPI I Think In Pink nail polish is a much lighter pink than Essie Lovie Dovie. L'Oreal Trust Fund Baby is a warmer redder pink with shimmer. NARS Trouville (reviewed here) is a lighter and significantly warmer pink. Overall, I'd have to say Essie Lovie Dovie is a fun, girly pink. I'll definitely be adding it to my pink pedi rotation in the upcoming summer months! Thanks for reading! What Essie nail colors have you been loving lately? What are your favorite bright pinks? This Father's day, I have the perfect gift tucked away for Mr. Lovey, thanks to Prada Parfums. Fragrance is a great way to add something fresh to his routine (plus, the effect is something I can enjoy as well). Prada is one of my personal favorite perfume lines, so I'm looking forward to sharing my review of Prada Amber Pour Homme Intense cologne and the newest Prada Amber Pour Homme Intense fragrance gift set with you today! Prada Amber Pour Homme Intense Eau de Parfum is a warm and smooth blend of Italian bergamot, Somalia myrrh, Indonesian patchouli, Madagascar vanilla. Prada Amber Pour Homme opens with the strong bipartite warmth of the prickly resin of myrrh alongside smooth amber tones. Patchouli adds a transparent clean smokiness which lends an incense-like illusion to the above combination. As the amber and myrrh soften, an even vanilla adds a delectable hint, while bergamot adds a crisp and fresh contrast. Over time the vanilla develops with tonka (your classic dessert combo), with a sweet little strand of saffron stirred into the pot (which I love). In the next stage, we meet a gentle wood, root, and leather combination; the sandalwood, vetiver, and leather notes are softly blended as to not highlight any one component. Flowers in the form of a mid-tone geranium and and an uplifting orange blossom add just the right hint of delicacy and sophistication to an otherwise strong masculine scent. After its rich tale, Prada Amber Pour Homme Intense returns to its amber, myrrh, and vanilla base at drydown. The Prada Amber Pour Homme Intense fragrance set showcases the gorgeous cologne in three different forms : Eau de Parfum (3.4 fl.oz. ), an After Shave Balm (3.4 fl.oz. ), and Bath and Shower Gel (1.7 oz.). All four bottles are tall, rectangular, and elegantly slim. The Shower gel is shown above in blue, while the body lotion is the cream colored bottle seen below. 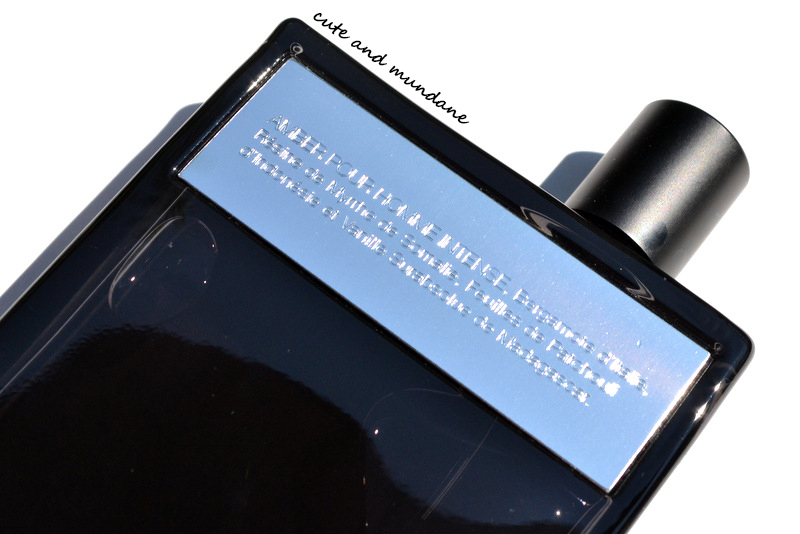 I especially love the look of the Eau de Parfum, with it's dark glass plated with a metal --- upon which you can read Prada Amber Pour Homme's note list! The Prada Amber Pour Homme Intense fragrance gift set ($80 for $144 value) showcases a fragrance that should please both discerning noses and aesthetes! 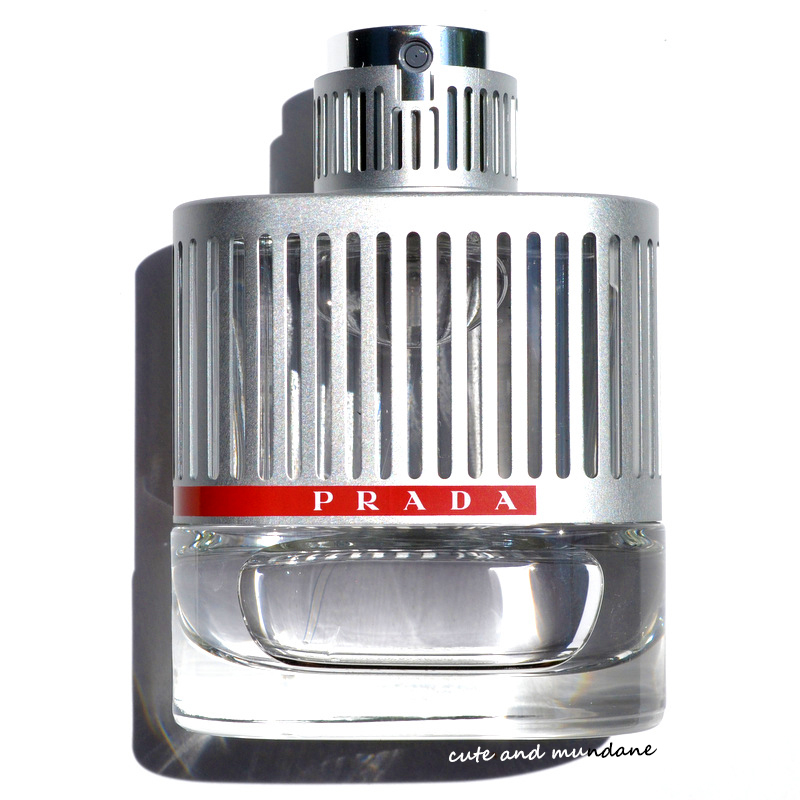 The masculine scent is elegant and well crafted, as is typical of Prada Parfums. I'm definitely looking forward to experiencing Prada Amber Pour Homme as it enters Mr. Lovey's fragrance wardrobe! Prada fragrance gift sets for Father's Day are now available at Macy's, Nordstrom, and other fine department stores. P.S. 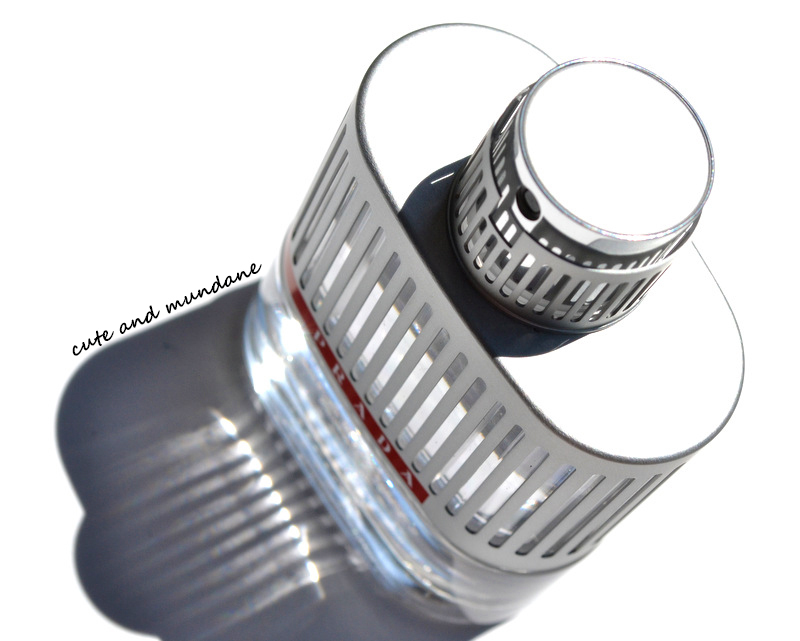 For more Prada cologne reviews, be sure to check out my review of Prada Luna Rossa! There's a new cologne that's been making quite a 'splash' this year! Prada Luna Rossa Eau de Toilette is Prada's newest men's fragrance. It's inspired by Luna Rossa (Red Moon) Challenge, an Italian sailboat racing syndicate that competes in the America's Cup. You might already be able to appreciate the maritime inspirations in the sleek metal and glass bottle above! Mr. Lovey and I have been enjoying a press sample of this sailboat inspired cologne. I'm excited to share my review with you today! 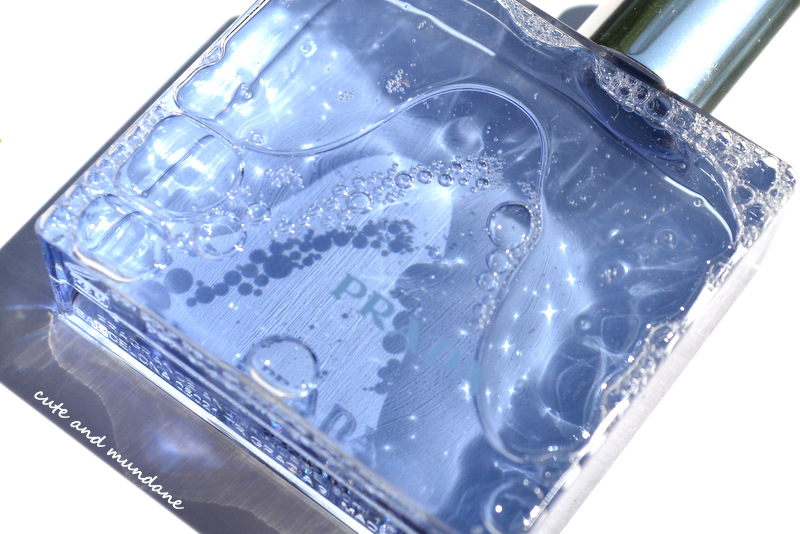 Prada Luna Rossa Eau de Toilette is a fresh splash of herbs in a smooth marine base. The cologne opens with an aquatic blast, like a high wave splashing over the bow. However as quickly as the water arrives, it rolls overboard and gives way to an even keeled lavender. A strong herbal sage steps in like a seasoned skipper to command our immediate attention. A hefty bitterness opens and eventually develop into a recognizable, albeit still bitter, orange. Concurrently a spearmint builds and delivers an overt cooling sensation , with just a hint of dry mint leaf. The spearmint's icy coolness combines with the bitterness of the orange for a sharp, yet complimentary effect, like salt spray whipping the sails in arctic winds; this combination persists for some time. Over time, the ambrette, a cool and almost sour metallic note (that you can almost taste at the back of your throat), makes itself known. Its similarities to the prior cool mint and bitter orange combination make such a natural transition that you might not even notice it. An amazing smooth dry wood with a subtle creamy marine sweetness --- which I assume to be Ambroxan, a molecule used to approximate ambergris --- permeates the base, binding the scent together like the classic teak and lignum planks that have braced marine hulls for centuries. The dry down is calm and less tumultuous than the fast moving water and herbal openers; one can't help but appreciate the finesse of the Ambroxan base with threads of ambrette and bitter orange weaved throughout. Before sniffing Prada Luna Rossa, I had imagined it to be simple sea-inspired scent; however I found that it was indeed a sailboat-inspired scent as promised. The cologne has marine tones, mainly due to the beautiful, permeating thread of ambroxan, however it's not a mellow wafting water scent a la Armani's Aqua di Gio. Instead we get a feel of waves hitting a hull, in the form of sharp splashes from sage and a cool spray from spearmint. Finally, the contribution from the metallic ambrette combined with the bitter orange imparts the feel of sleek metal and composite hulls of modern racing yachts. Overall, Prada Luna Rossa Eau de Toilette ($54 for 1.7 fl.oz.) is a sporty and fresh combination of marine tones with a twist of herbs and metallic notes to keep it light and buoyant. This adventurous new cologne is now available at Sephora for Father's Day and beyond! Thanks for reading! 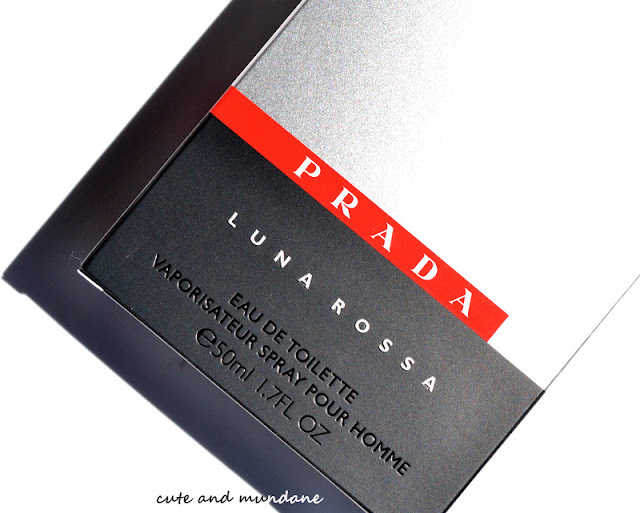 Have you tried Prada Luna Rossa? 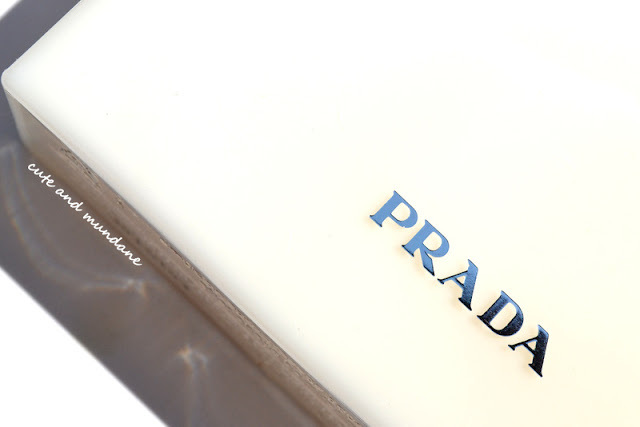 What Prada fragrances have you tried? What kind of scents do the men in your life enjoy? P.S. 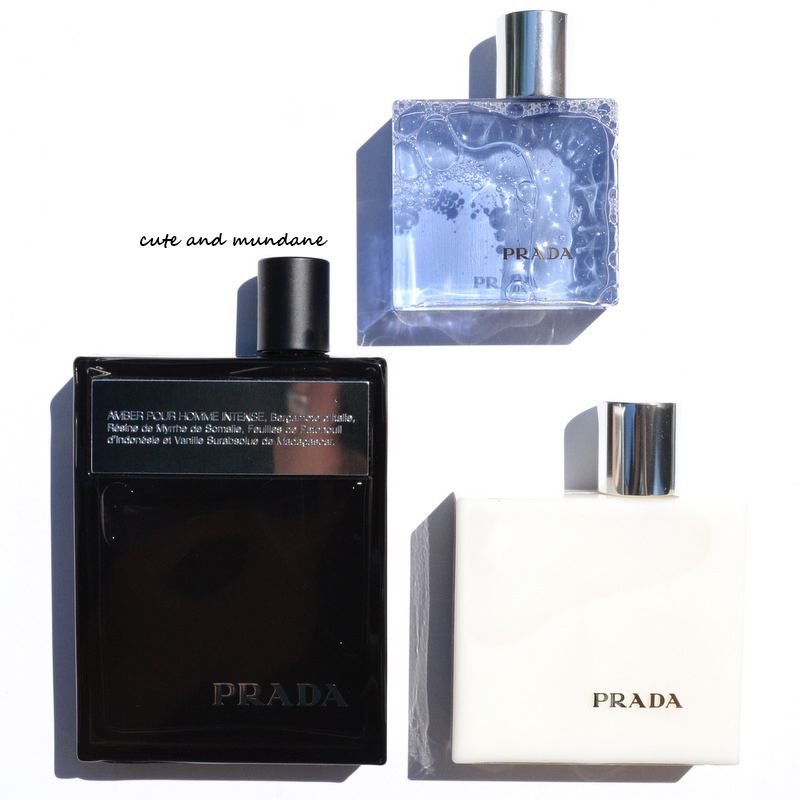 For more Prada, check out my reviews of Prada Infusion d'Iris and Prada L'Eau Ambrée! Shakespeare's A Midsummer Night's Dream is a tale set in the context of the wedding of Theseus, Duke of Athens, and Hippolyta, Queen of the Amazons. There are several intertwined storylines, brought together by the machinations of mischievous fairies. Perhaps the most provocative tool of fairy magic employed in the tale was the Love in idleness, a white flower turned purple when struck by cupid's bow. When juice from the transformed flower is applied to closed lids, a person will fall in love with the first thing he or she sees upon waking. As you can imagine, this leads to quite a bit of comedic misadventure! Le Métier de Beaute has tickled our fancy this summer by creating a palette inspired by A Midsummer Night's Dream: The Le Métier de Beauté Summer Night's Dream Kaleidoscope Eye Kit. I've been delighting in this set, thanks to LMdB, and have a review to share with you today. It's a collection of four lovely colors with which to anoint to our lids --- don't worry, they aren't quite as potent Shakespeare's fairy flowers, but be forewarned, you still just might fall in love! 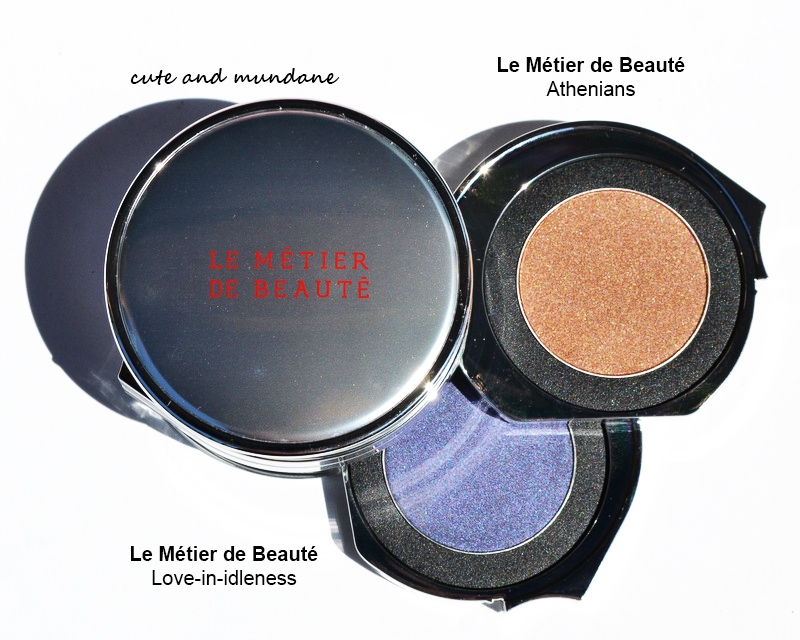 The Le Métier de Beauté Summer Night's Dream Kaleidoscope Eye Kit is packaged in reflective silver plastic packaging. It has a hinged mirror on top and four pull-out layers, each with one eyeshadow within. 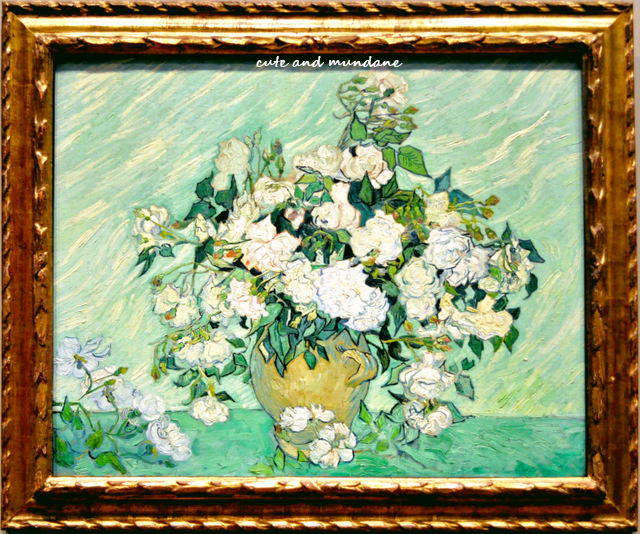 The shades were designed to be layered from top to bottom using LMdB's Couches de Couleur (Layers of Color) technique. You can see the Shakespearean inspirations in the name of each eyeshadow. The colors included are as follows, from top to bottom. Midsummer is an ethereal pink-gold. Fairyland is a silver-flecked grey. Athenians is a warm bronze. Love-in-idleness is a deep indigo blue shadow. I've swatched the Le Métier de Beauté Summer Night's Dream Kaleidoscope Eye Kit below, along with a few other colors in my collection so you can get a sense of the nuances in each shade. 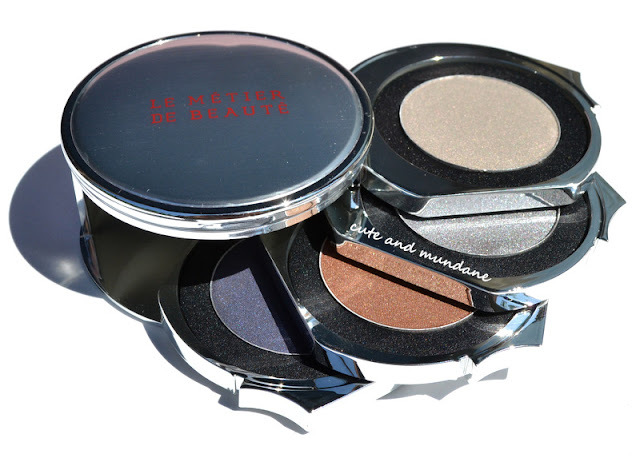 MAC Vex eyeshadow is very similar to Le Métier de Beauté Midsummer; both have an oyster base and a pink sheen. 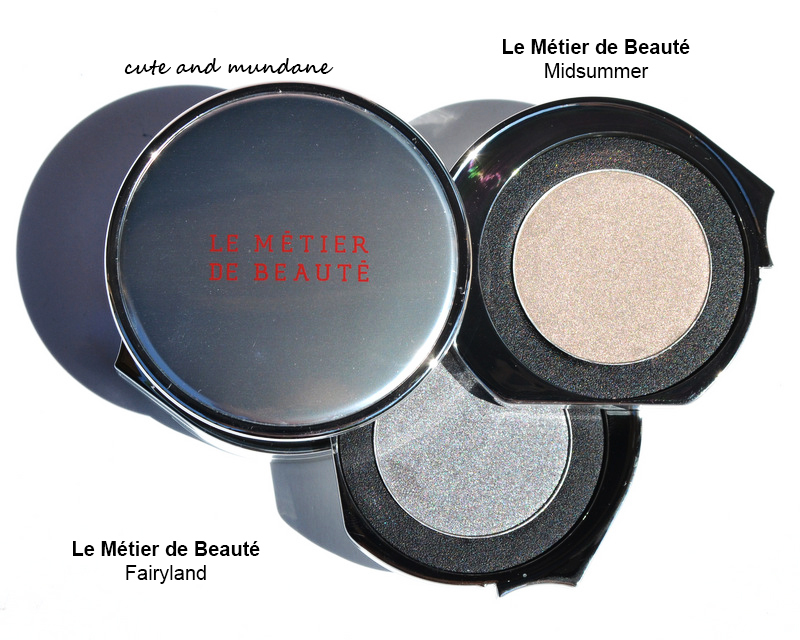 MAC Tzarine eyeshadow has a similar intensity to Le Métier de Beauté Fairyland, the latter has more pink tones, while the former has more gold tones. NARS Lola Lola eyeshadow (see story of how I purchased it here) is similar to Le Métier de Beauté Athenians, however Lola Lola is more red toned, while Athenians has more gold shimmer. Chantecaille Black Tip from The Sharks palette (reviewed here) looks similar to Le Métier de Beauté Love-in-idleness in the pan, however they are quite different when swatched. Chantecaille Black Tip is a much more brilliant blue, while Le Métier de Beauté Love-in-idleness has a blacker base and an indigo sheen. I love the combination of misty cool tones with warm hues in the Le Métier de Beauté Summer Night's Dream Kaleidoscope Eye Kit, as I regularly employ this kind of contrast in my everyday routine. The colors are beautiful and practical, befitting an Amazonian or Fairy Queen --- and perhaps even your lids this midsummer! The limited edition Le Métier de Beauté Summer Night's Dream Kaleidoscope Eye Kit ($95) is available exclusively at Bergdorf Goodman (if interested, call for more info at 212-872-8612). Thanks for reading! Have you read or seen A Midsummer Night's Dream? What Shakespearean plays are your favorites? What was the last LMdB product you tried? P.S. 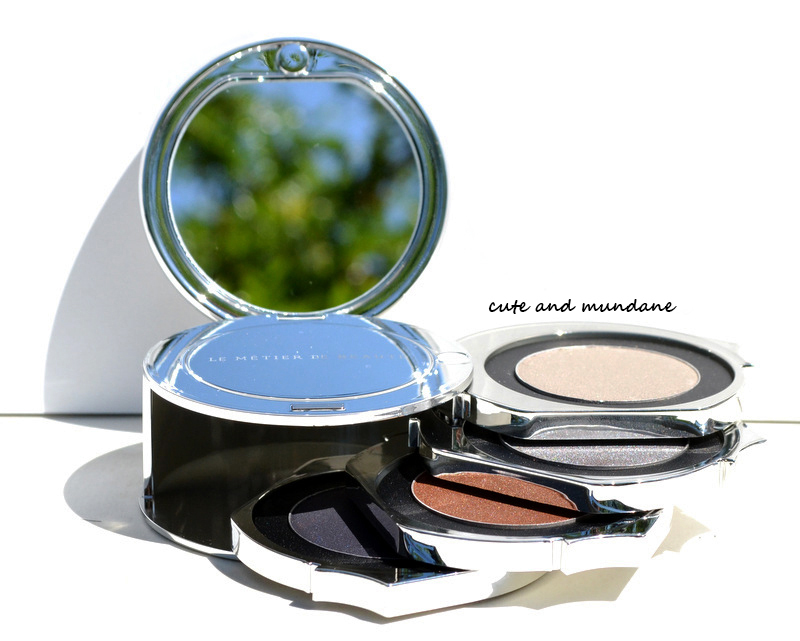 For more Le Métier de Beauté, be sure to check out my review of Le Métier de Beauté True Eye Color in Nutmeg. As someone who's spent a good portion of her life in New England, the thought of summer conjures up images of sailboats, embroidered shorts, and sailor stripes. 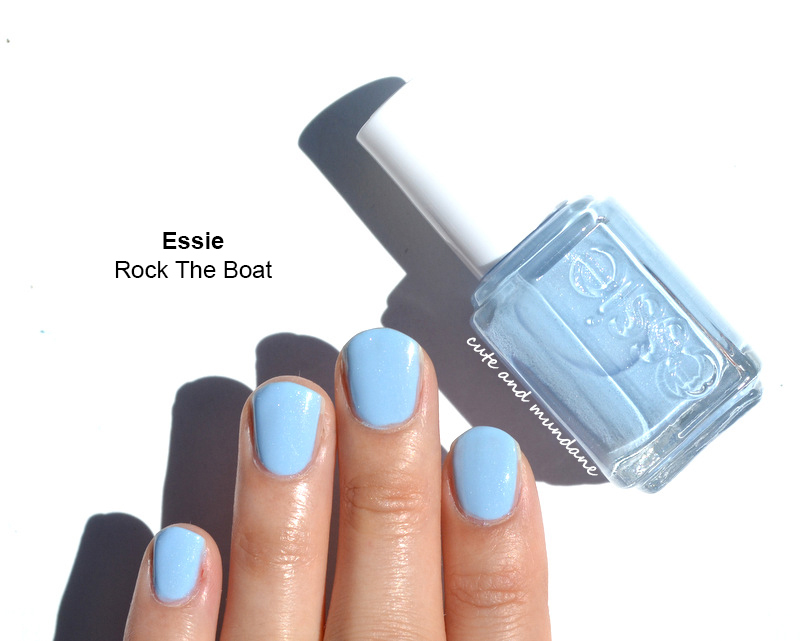 When Essie Rock The Boat and Essie Full Steam Ahead from the Essie Naughty Nauticals nail polish collection for Summer 2013 landed on my desk courtesy of Essie, these cute and classic images of American summers spent waterside came to the forefront of my mind. I've been enjoying these two colors this past week and can't wait to share my review and comparison swatches with you today! 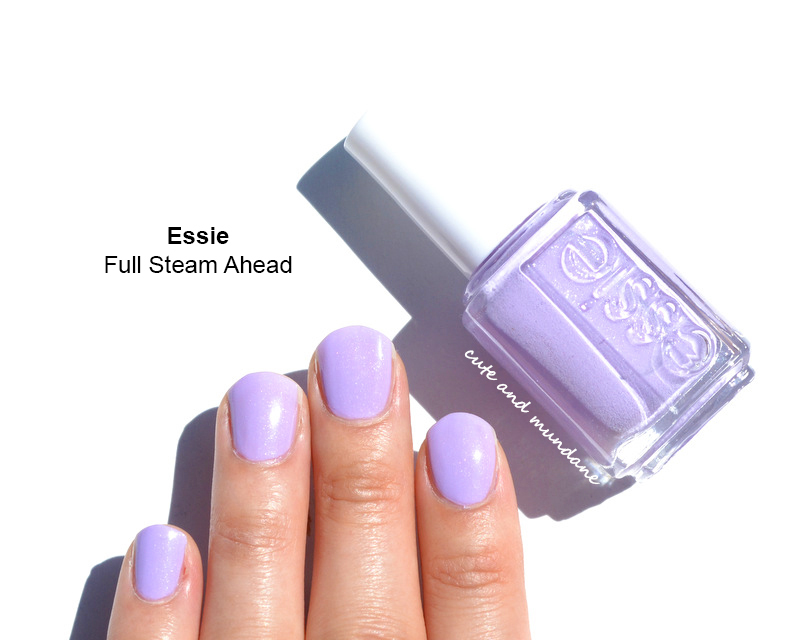 Essie Full Steam Ahead is a light lavender, and Essie Rock the Boat is a light french blue with a hint of periwinkle. Both colors have a very subtle shimmer that you might not notice at first glance! 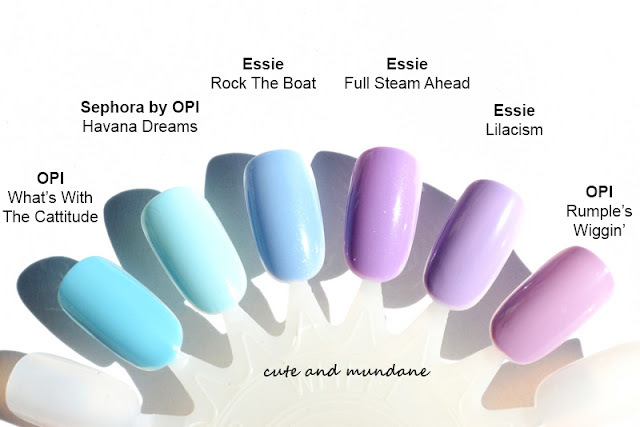 I've made some comparison swatches below to give you a better idea of what Essie Rock The Boat and Essie Full Steam Ahead look like. You can see that Rock the Boat is much more periwinkle toned than the sky blues of Sephora by OPI Havana Dreams and OPI What's With The Cattitude?. It has the same intensity of color as the former, but is darker than the latter. Essie Full Steam Ahead is very similar to Essie Lilacism, but it has shimmer and is a bit more red toned. OPI Rumple's Wiggin' nail polish is more pink toned. The Essie Rock The Boat and Essie Full Steam Ahead are perfectly pretty, peppy, and preppy colors for tips and toes this summer! Both colors are unique in my collection; I really like the periwinkle tones in the former and the slightly pink tones of the latter. Essie nail polishes are available at Essie.com, Ulta, and other beauty retailers. Thanks for reading! Have you had a chance to play with Essie Naughty Nauticals? Which colors stand out to you? What was the last Essie polish you wore? Copacabana is a neighborhood in the Zona Sul of Rio de Janeiro, Brazil. It's famed for its bright sandy beach resorts, which run for four kilometers! With one glance at the sparkling shoreline, it's easy to see how this seaside paradise inspired NARS Copacabana. I've had a long term love affair with the pearly glow of NARS Copacabana. My first NARS multiple was NARS Copacabana, which I reviewed in the earlier days of Cute and Mundane (read here). When Copacabana came out in Illuminator form, I had to pick it up! 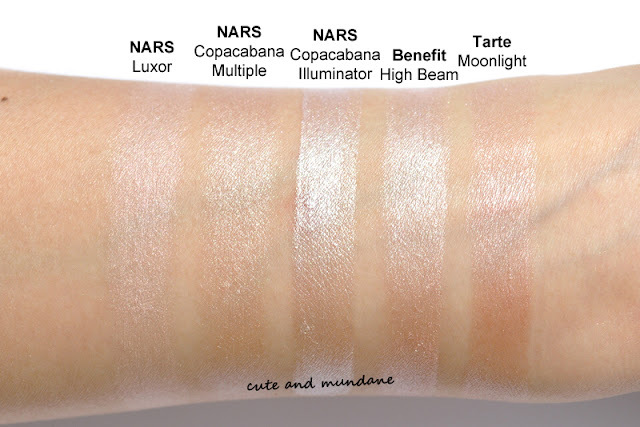 NARS Copacabana Illuminator is a pearly liquid highlighter. The shimmer is quite concentrated so I use the smallest amount I can manage. 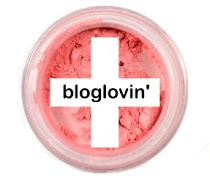 I typically apply it to my cheekbones, bridge of nose, and other places that one would typically highlight. I find that evenly distributing it on fingers and patting it on gently works better than rubbing it in. NARS Illuminators tend to last longer when worn than NARS Multiples. 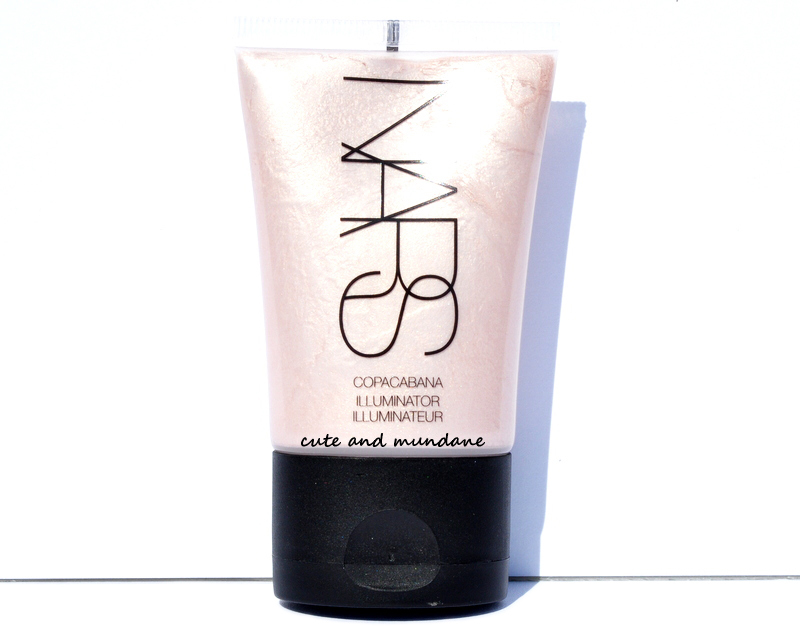 NARS Copacabana Illuminator is a pale pearly beige-white with high shine. 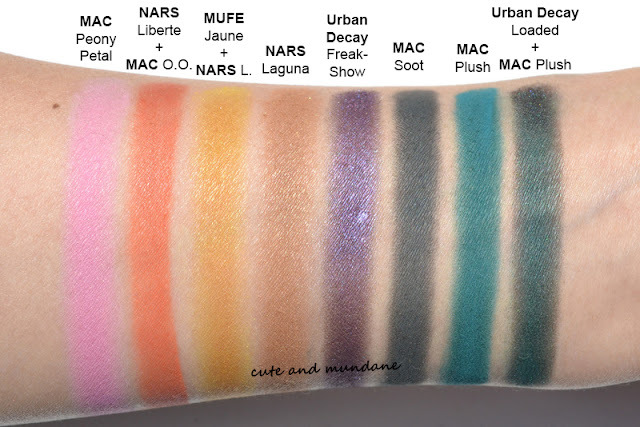 I've swatched it next to some comparable highlighter colors. You can see that the Illuminator is cooler and slightly pinker than the NARS Copacabana multiple (reviewed here); it has a much more intense white shine. 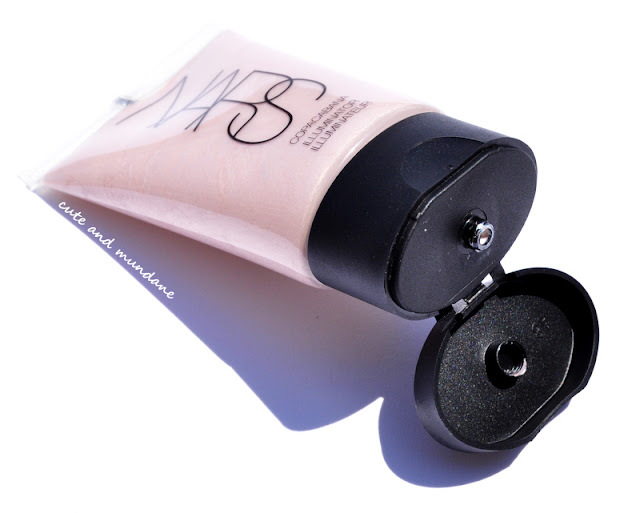 NARS Luxor Multiple (reviewed here) is cooler and pinker. 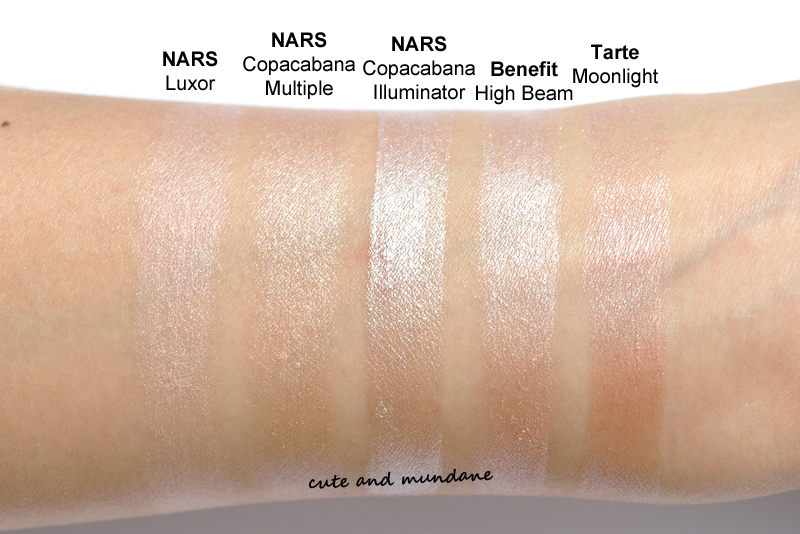 Benefit High Beam is the most similar to NARS Copacabana Illuminator of the bunch. However, it is slightly pinker and darker. It is also a little less reflective and has much less white shimmer than Copacabana. Tarte Moonlight Blush & Glow Brightening Luminizer and Cheek Tint is darker and more peachy pink than Copacabana; the shimmer is also subtler. NARS Copacabana Illuminator is a staple highlighter in my collection. I love the cool tones in the color and how it's more long lasting than the multiple version (reviewed here). I'd love to add all the NARS Illuminator colors to my collection eventually (and I keep hoping that NARS will come out with a Luxor Illuminator)! Thanks for reading! Have you tried NARS Copacabana or any of the NARS Illuminators? What NARS products have you been loving lately?